dated the beginning of the third millenium B.C. some specific data about Sumer's ancient relations with the Armenian Highland. and temples, particularly the Abzu, the sea temple of Enki, in Eridu. and gold and build and decorate Enki's temple. the goddess had promised Enmerkar that Aratta would submit to him. message to Enmerkar in teh courtyard of the assembly hall. with those of Enmerkar, that the letter bring him carnelian and lapis lazuli. "fighting men". Thus "the stronger will become known." her house and bed there. lapis lazuli to Erech and heaped them p in the courtyard of Eanna for Inanna. but with one in this case who bears teh good Sumerian name Ensukushsiranna. remain in Erech and demands that Ensukushsiranna become his vassal. Ensukushsiranna gathers the members of his council and asks them for advise. They counsel him to submit to Enmerkar, but this he indignantly refuses to do. one to undertake the dangerous journey to Aratta to deliver the message. Whereupon, Lugalbanda steps up to his kind and bravely volunteers for the task. of Anshan to the other...and finally arrives with joyful step at his destination. the Bible and adoped by Kramer). interrelationships of the lords of the two city-states. Aratta and Erech. shrines, particularly, the temple of Eridu. which Enmerkar is supposed to build. from Elam to Baspurakan, to the west of Lake Urmia. assumes to be the home of the Hurrian people in the neighborhood of Lake Van. and not so far as the south of the Caspian Sea. not by boats; obviously it would have been extremely difficult to navigate upstream. live and grow in a river. and unusual fish that lived in the river nearby. links Sumer with the land of Ayrarat). Aramali, mentioned by Shalmaneser III, and Mount Ararat. by a name derived from Ara, such as Aratta. Deimel considers it probable that the word aratta, had in fact, the composition ar-ar-ta. Assurnasirpal II, rather than from the name Uruatri. It is obvious that the radical element Ar(or Ara) is a component of Aratta (or Ararta). and Urartu/Ur-ardi (place of Ardi-Ara). From what has been reported by Khorenatsi, we already know that Ayrarat meant ‘Ara’s plain’. possible, therefore, that the name Urartu (Urardi, Uratri, or Uru-atri) is perhaps a later cuneiform expression of the name Ayrarat (Ararat) or Aratta (Ararta). Thus it becomes apparent that the name Aratta (or Ararta) belongs to the group of place-names in the Armenian highland which are formed with Ar or Ara. It follows, then, that Aratta turns out to be the oldest city-state of the Armenian Highland known so far, dating from the beginning of the third and possibly from the end of the fourth millennium B.C., the memory of which persists, most probably, in the name Ayrarat (<Ararat). As mentioned earlier, even though all the information regarding the ancient ties and relations between Aratt and Erech (hence Sumer) have reached us in the form of epic poems of some 1500 lines preserved on a series of cuneiform tablets, still they constitute a valuable source where we find the reflections of real historical events and socio-economic conditions. One must remember that the epic tale was the main and only style of historiography in that remote past, at the very beginning of written history. We find, therefore, that what is transmitted to us through the four variants of this epic tale has inestimable value for the history of the most ancient period of the Armenian Highland., the land wherein lie the sources of the Tigris and the Euphrates. These tales are like beams of light that pierce the obscurity of the past and shed a momentary glow on the political, social, religious, economic and cultural condtions of the peoples of the Armenian Highland in that very early period (the beginning of the third millennium B.C. ), which is still dark for modern historiography. They elucidate, in particular, their ties and interrelations with Sumer, about which we shall speak again in our next chapter. There is a number of similarties in government structure that can be observed between Aratta and Erech. Both city-states had an “en” (priest-king) at the head and a council of “elders” (or communities). Each state had the same type of divisions of administrative and political affaris, and functions and functionaries were designated by the same terms (ensi, sukkal, shatam, ragaba, ugula). The religious tie between Aratta andErech (hence Sumer) is striking in the epic tale. Inanna, the goddess of love and war, who is considered Sumerian (and whom the Semites identify sometimes with Ishtar), belonged earlier, according to the tales, to Aratta, and it was none other Enmerkar himself who brough her to Erech. As we have seen, it was Enmerkar who asked Inanna of Aratta of intervene in favor of securing Aratta’s help to save Erech from the siege of the enemy Martu, and Inanna had warm welcome for Enmerkar’s herald Lugalbanda ir Aratta. In the epic tale the goddess Inanna is figured as the supreme power, since Enmerkar’s envoy asks her for help. She had the highest authority in her hand and her will was decisive, indicating that in those days the idea of matriarchy had not yet vanished entirely in Aratta, and that particular social order was still maintained to a certain extent under the supremacy of the goddess Inanna. She is represented as the mother and the patron of her people and her land. This particular characteristic of Inanna’s nature has persisted for millenniums, and in the last centuries of paganism has been represented by the goddess. ANAHIT as the patron mother of Armenia. Moris Jstow writes that Assyria had only one goddess, Ishtar, who had the same rank in the Semitic pantheon as the goddesses Nana, Nina, Ninni, Inanna, and Anunit had in Sumer. This shows that the forms Anunit(Anahit) and Inanna represented variants of the same name of the same goddess. 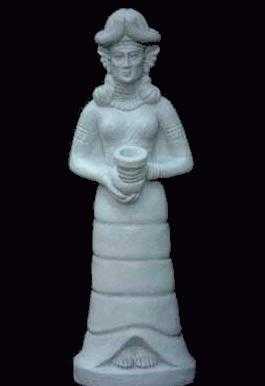 It is clearly seen, then, that in Armenia, in the later periods of paganism, Inanna appears as Anahit (sometimes as Nane). Nu, as the abbreviated from of these names (in derivation), is the first component of the name of the Armenian goddess Nuart (Nuard), who was the consort of the sun-god Ara. In the times of Urartu, the name Ara appears sometimes in the derivative form Ar-di (Ardi), which, as is obvious, is the second component of Nu-ard. The word nu is preserved in Armenian with the meaning of ‘bride’. Hence Nu-ard means ‘the nu of ard’, that is “Ara’s bride or wife’. This agrees with Khorenatsi’s testimony that Nuard was Ara’s wife. In Sumer, Inanna’s consort (and Ishtar’s in Babylonia) was Dumuzi (Tammuz), who, by virtue of his nature, is identified with Ara by Armenologists. Hence, Nuard is none other than Inanna. We can accept, therefore, that in spite of the many upheavals and tribulations throughout the millenniums, the goddess Inanna, being preserved under the names Nuard and Anahit, has continued to remain the patron mother and the native goddess of fertility and war of the Armenian Highland, that is, of Aratta(or Ararta). ‘Ara’s land’; a fact, about which, as we have seen, there are direct and concrete references in the Sumerian epic tale. Enmerkar, the king of Erech, was belived to be “the sone of the sun-god Utu.” Hence, considering Inanna his sister, he has demanded from Aratta to supply stoneworkers for the construction of the temples in Erech and Eridu. This reminds us of a similar case in much later times: towards the end of the 10th century A.D. the Byzantine emperor Basil who was of Armenian origin, invited the renowned architect TRDAT from Armenia, the land of his ancestors of the St. Sophia Church in Constantinople, demolished in an earthquake, because there were no capable masters there at the time. For the construction and embellishment of the temples in Erech and Eridu, Enmerkar has asked Aratta to supply not only metal and stoneworkers and sculptors, but also precious metals (gold, silver), precious stones (“carnelian, lapis lazuli”) and building stones (“stone of the mountains”) in return for grain. What can be concluded from this is that the people living in the Armenian Highland at the beginning of the third millennium B.C. must have had an economy rich in the production of precious metals and stones and building materials, that, compared to their neighbors, they must have reached a considerably high level of development in metallurgical and quarrying industries, and that they must have already had, in these early times, skilled metalworkers, sculptors, masons and architects, capable to build and decorate temples and shrines, whose fame had spread to faraway lands, even to Sumer, which developed as she was, still lacked the materials and the skills. The fort, protected by strong Cyclopean walls, contained basically the dwellings of the rulers and the priesthood, the temple complex and the main productions units (foundaries, workshops, metal-enrichment plants). The pre-Urartian city consisted of the living quarters of the middle and lower classes. The city had a separate shrine, a section of which is preserved in the place called Karmir-K’arer (‘Red Stones’). The finds reveal tha the occupations of the inhabitants consisted of crafts, trade, husbandry, viniculture and vegetable growing. There existed a large-scale smelting industry, evidenced by the cylindrical brick smelters and heaps of spent mineral and casting molds found near them. In Medzamor an extensively developed animal husbandry had contributed to widening the gap between classes of property owners. This is testified by the huge stone burial chambers excavated in a field of about 50 hectares of surface area and extending approximately half a kilometer to the east and the northwest of the citadel. These burial chambers that belonged to leaders and other representatives of the court were enframed with tablets decorated with high relief sculptures of horses and lions. In the center of the burial chamber was the tomb of the leader, buried on a wooden bier, together with various objects of gold, silver bronze and tin, shaped beads of carnelian, agate amber and glass, colorfully varnished pottery, ceramic ware ornamented with hunting scenes, and stone goblets, all of which are eloquent witnesses for the high level of development of the crafts, saturated with technological innovations, particularly in jewellery and metallurgy. Along with the leader were buried also servants, slaves, horses, big and small horned animals (and probably hunting dogs). But the most remarkable find among all the others is a sculpture of a frog, made of onyx, which is a Babylonian weighting-stone, and bears cureiform inscriptions. It is dated 16th century B.C. 1. The story told in the Sumerian epic poems has taken place in the first quarter of the third millennium B.C. Medzamor was in full activity at that time. 2. Medzamor is situated in the Ararat valley which was part of Ayrarat. As we have seen, Ayrarat corresponded to Aratta by its geographical location (and probably also by name). There were built in Medzamor not only Cyclpean walls and towers, but alos temples and dwelling structures. In fact, the land of Ararat is very rich in basalt, marble and various other building stones; it is actually the richest region in the world in light and beautiful tuff. This, too, was ample justification for Enmerkar to ask Aratta to supply “stones of the mountain, “ sculptors and stoneworkers for the construction of temples. 4. As we have seen above, archaeology has revealed that in Medzamor, between 2800-2600 B.C. , people have observed the rising of Sirius and have worshiped it. One cannot bypass such an important evidence and we would like to draw particular attention to it. First it must be noted that Enmaerkar lived exactly in these days. Being Gilgamesh’s (cir. 2680 B.C.) grandfather, he must have lived around 2750 B.C. Second, from the information given in the epic tales, we know that the goddess Inanna was none other than Sirius,(23) and that the rising of this star was considered by the people of Aratta as sign that she belonged to them and protected them. This is why king of Aratta has ent a message to Enmerkar (through his herald) stating that Inanna had not abandoned neither Aratta nor her house therein (the ziggurat-temple that was also an observatory). 6. The ties and the communications of Aratta-Ayrarat with Southern Mesopotamia (with Sumer and later with Babylon) over the Euphrates and the Tigris have continued for millenniums. One of the tangible proofs for these relations is the Babylonian weighing-stone, discovered at Medzamor (and dated the middle of the second millennium B.C. ), that bears the sculpture of a frog with cuneiform inscriptions and tells a lot about the metals and the precious stones to be weighed for Babylon, thus testifying to an active trade with her. The trade relations that Armenia had with Babylon have continued for thousand of years even after the time of this weighting-stone. They have constituted a firm and natural tradition between the two countries conditioned by the two waterways, the Tigris and the Euphrates. Herodotus has supplies substantial information about the business that went on between the Armeians and the Babylonians over the Euphrates. As it was mentioned earlier, in evaluating the credibility of the events related in the epic poems, one must not forget that the epic poem was the only historiographic style employed at the time, and although the legendary unfolding of the events presented there cannot be accepted literally, nevertheless, they contain certain elements based on real historical facts which must be evaluated as such. For example, we, certainly, do not accept that every single word exchanged between the two kings were literally true, nor that the herald had really made so many trips and so fast between Erech and Aratta, quite far from each other, to carry a response for every statement; but we do not overlook the essential significance of the mission either. In essence, the information contained in the epic tales attributes to Aratta an important participation in the construction and adornment of the temples in Erech and Eridu, the most ancient cities of Sumer. In other words, the people of Aratta have played a prominent part, with their contribution of precious metals, stones and craftsmen, in the work of building and embellishing these cities, the initiative of which is credited to Enmerkar. It is possible to give more than one and varied explanation for the reasons of the close ties that are observed between the material and spiritual cultures of Erech and Aratta. Some authors assume that the Sumerians may have come from the north and before moving to Southern Mesopotamia via the Tigris and the Euphrates (at the beginning of the fourth millennium B.C. or earlier) they may have stayed for some time in the Armenian Highland (around Aratta). Such an assumption, of course, entails close contract and religious, cultural and even marital ties with the people of the Armeian Highland. There are some indications that the Sumerians have previously been a mountain people and that they belived that their gods dwelled on mountain tops; this is the reason why in Sumer they built high ziggurats and placed their god’s throne on their summits. Enmerkar, who was regarded as “the sone of the sun-god”, considered Inanna, the goddess of Aratta, as his sister, and he was the one who brought Inanna, formerly belonging to Aratta, to Erech and built a temple for her. In our previous works we have spoken at length about the Sumero-Armenian connections and have brought our more than one hundred Sumerian words that have their parallels in Armenian, close to half of them being Indo-European. On the other hand, the number of Sumerian words known to us that concur with Armenian is more thatn tow hundred. The close time between Aratta and Sumer could have developed by means of natural-traditional interrelationships coming from a more distant past, made possible between the two sides through the Euphrates and the Tigris waterways. As we have seen, the epic tale speaks about building vessels to transport construction material and craftsmen from Aratta, on pack animals. As long as the Tigris and the Euphrates have existed, the ties between the peoples living at their two extremities must be taken as a natural phenomenon of millenial antiquity. One of the proofs of these contacts is the concrete testimony given by Herodotus (5th century B.C.) who, writing more than two thousand years after the times of Enmerkar, states that the Armenians had very close commercial ties with Babylon over the Euphrates, and describes in detail how they would load their merchandise and donkeys to shield-shaped rafts made of wood cut from the forests in Armenia and covered with hides, how they would sail down the river to Babylon, and after selling the goods and the wood of the rafts, they would load the hides on the donkeys and return home, only to start the trip over again. According to Xenophon, the Armenians had connections even with India. He informs as that King Cyrus of Persia had asked the Armenians to accompany the Persian ambassador to India and present him to India’s kings. These examples are important indications showing the ancient traditional relations that the Armenians had, through the Euphrates and the Tigris, with Southern Mesopotamia and even beyond, with India. Otherwise, why wouldn’t Cyrus ask such a service of some other people living in the south of Persia and closer to India, such as the Elamites or the Babylonians? Obviously for the reason that Armeians already had a fame in matters of this nature. It is also possible that the Sumerians could have acquired their knowledge of and developed connections with Aratta merely by means of the intrusions they made to that country, let by a curiosity for the mysterious highland where lay the sources of the Euphrates and the Tigris, or during their marauding or conquering raids to that rich highland. The Sumerians had traditional legend about these sacred rivers that wre vital for them. The distant land where they sprang forth and where the gods who made them flow had set their thrones, was shrouded for them with legendary mysticism. The Sumerians belived that gods dwelled on mountain tops, that is why they used to build high ziggurats, symbolizing mountains, as the dwelling-place of their divinities. It is natural, therefore, that a strong desire would be aroused in them to reach that mysterious highland, to know and even to conquer it. It should not be considered unlikely, therefore, that in the times of Enimerkar (perhaps even before) the Sumerians might have reached Aratta and established connections with her. It is also possible that the Sumerians could have inherited the traditions about Aratta’s wealth, culture and fame from those groups of natives of the Armenian Highland who, moving along the streams of the Euphrates and the Tigris, penetrated or immigrated to Southern Mesopotamia in much earlier times (before and after the arrival of the Sumerians), settled there and later mixed with Sumerians. We have already seen that Armani was in the land of Subari, or, more precisely, the central region of the main land called Subartu corresponded to the southern regions of the Armenian Highland. PARADISE/DILMUN/ETEN/LAND OF THE ELDER [NETJERU] GODS. THROUGHOUT THE GLOBE OF THIS ERA. [OR EVEN ASEXUAL] RITE...BE IT PHYSICAL, MENTAL OR SPIRITUAL. TIGRIS AND EUPHRATES FLOW IN-BETWEEN AS SERPENTINE RIVERS/WATERS. WITH THE MAGICK POUCH OF EA THAT HOLDS THE SACRED CONES OF POWER. IN SYMBOLIC [SUBLIME] RATHER THAN EXOTERIC [WRITTEN] FASHION. ARARATIAN TRADEMARK SACRED SEALS FROM ARGIŠTIHINILI [ARMAVIR]. TOOK PLACE INITIALLY TO THE IMMEDIATELY SURROUNDING AREAS. ALL OF THE NEAR EAST AND EVENTUALLY ALL OVER THE WORLD. [SEE SUBSEQUENT PAGES OF THIS CHAPTER]. ESPECIALLY THE GODDESS/SACRED FEMININE] SPIRITUAL ARCANUM. ARARAT...ARATTA --The Land of the Mountains Where the Gods Live of the great Epic of Gilgamesh. The Land where the Garden of Eden -- the Tree of Life and the Tree of Wisdom is located...the Twin peaks of Mashu -- the SYMBOL of the holy Cosmic Mountain. When many of us hear this name we picture the birth and rebirth of humanity and human civilization in the sacred highlands of ARMANIA. THE BEAUTIFUL BIG BRIGHT WIDE EYES. THE DIVINE ESSENCE OF ALL.. The Sumerians that were of Armenic or Armenid extraction had established one of the first centers of civilization in the lower part of Mesopotamia. Many scholars agree that Sumerians initially inhabited Armenian Highland and gradually descended to first Northern Mesopotamia and eventually spread further south, establishing the cities of Ur [excavated by Sir Leonard Wooley in the 1920s], Uruk and Eridu [note the sacred variations -- AR-UR-ER-OR prefix]. Fortunately a number of Sumerian inscriptions dating from somewhere between 2750 and 2500 BC have been preserved. Edited by Ashot, 11 February 2008 - 07:41 PM. The Akkadian king Naram-Suen [2236 - 2200 BC] launched an incursion into the Armenian Highland in order to fight the powerful kingdom of ARMANI or ARATTA under the leadership of the Armani-Armenian King Madakina. In the inscriptions that were made both in Akkad and in southern portions of Armenia, he gave the details of the military campaigns against the Kingdom of ARMANI around the area of Lake Van. It is interesting to point out here that, the inscriptions tell us that later a portion of the the warrior highlanders of Aratta would later descent onto lower Mesopotamia -- defeat Naram-Suen -- and secure their own rule over the Near East. The word Armani - an early form of Armen-Armin [Armen or Arman denotes the national affiliation, as with many cultures standing for the particular nation thus, the God AR being the primary deity in the Indo-European pantheon - thus AR MAN denotes -- Men of Ar or Children of Ar, again initially AR standing for ARAREL-ARARICH [hence Ar-Ar-At the Place of ARAR] -- Create-Creator, also Sun, Light, Life and Love. Ash jan, ket yerord@ arden unenq. Metsamori masin arden ban ka. Yete Gevorgi mot avelacnelu nyuter kan uremn alter anenq Metsamori mas@. Ed jan, uremn asem... et keter@ vor n@shvelen shat karevoren nerkayatsnelu hamar. Gevork@ asats vor trutsik vochinch petq chi, amen inch chisht yev amenayn karevor tvyalnerov petqe linen... hima petqe havaqenq bolor nyuter@ keterov, vorpesi aveli hesht lini... dra hamar aysorva mer karevorutsyun@ da Gilgamesh and Arattan zargatsnelna... Yerp vor da verchatsnenq arten kantsnenq mnatsatsin!!! Kanenq aper- one thing at a time. Tesenq Gevorg@ inch a avelacnum, dranic heto kancnenq dasavorelu gortsin. Es keter@ Gevorkna asel grem Aratta jan!!! nents vor we need to work on these!!! vonc asek tgerq - will be done. Guy's this looks like Azeri intellectuals mythologies about their eternel Azerbaijan. I don't understand what is the point of attempting to go that far in history when a history starting from 600 BC is more than impressive, only the Greeks, the Persians from the region can pride themselves about. Guy's this looks like Azeri intellectuals mythologies about their eternel Azerbaijan. What are you suggesting that we are working on Azeri history? Did you even know that Azerbadrjan did not exist untill 1918? What's your point Domino jan, if it is a prooven history of Armenians why shouldn't I bare a pride into it and mention about it everywhere that I go? Why shouldn't we mention our history just like the Greeks and Persians? I don't understand what is the point of attempting to go that far in history when a history starting from 600 BC is more than impressive, only the Greeks, the Persians from the region can pride themselves about. To be honest with you Domino jan, I didn't expect this from you, you are the least I suspected of blocking the roots of our history, knowing your contributions for our cause and beliefs. Why do you think that Armenians had no direct connection with Greeks and Persians 3000bc? does our histyr start from 600bc? If we take it that way then lets just erase everything and start from 301ad. Ashot, our history as Armenians does start from 600-550BC, that is from when we were identified and with some homogeniouty. If you push that history to 3000 BC, then Persians and others from the region will have as much legitimity to claim that history as being part of theirs. The Persians spread their language from the province for Fars about the same time. The spread of Indo European language was at about 2000 BC, we probably share much more with the Hittites than some Ararrata groups which much little is known. Armenians are a mixture of all those people, including the Phyrigians and the identity really appeared at about 600 BC. The concept of ''proto-Armenian'' is not much important for us..., what we need to do is preserve our known history not some speculative history of what happened few thousands of years BC. But if you want to veste time and energy on old history do so, it will be more relevent to wok on the Phrygian script writtings, and if you want to push a little bit further maybe Hieroglyphic Hittite: http://links.jstor.o...9...>2.0.CO;2-L (pay particular attention on what it says about Armenian and Phyrigian). Edited by DominO, 15 March 2008 - 09:36 PM. Domino, it was only 7 days ago when you said congradulation to the people who worked on the project. "Congradulation Aratta and those who worked on it." Aratta, if you continue further in that thread you will see that I had no idea what the project was really about. I thought the site title was that because it was the name of your username. I first thought your project was related to stuff like counterings on youtube etc. To find out that the title represented really the subject surprised me.